The Republican Party has a new trio of Democratic villains: Rashida Tlaib, Ilhan Omar and Alexandria Ocasio-Cortez. The House GOP midterm strategy largely centered on trying to tie every Democrat to now-Speaker Nancy Pelosi — and it failed spectacularly. So now GOP leaders and the National Republican Congressional Committee are turning to the superstars of the House Democrats’ freshman class as their newest targets. It’s a move born, in part, out of desperation. House Democrats already have their ultimate nemesis in President Donald Trump, who’s proven to be one of the best political and fundraising foils in U.S. history. House Republicans, who now find themselves in the minority after eight years in power, badly need something else to rally around. Thus the focus on the three high-profile Democratic lawmakers, who have gotten more national media attention in the past three months than many members get in their whole careers. The NRCC has sent out thousands of emails trying to tie vulnerable Democrats to Ocasio-Cortez, Tlaib and Omar. And the committee’s website makes it appear as if these backbench members are running the House. While the NRCC still regularly bashes Pelosi, GOP lawmakers and aides privately acknowledge that Ocasio-Cortez, Tlaib and Omar are their main focus now. The GOP strategy risks a backlash — a party that has problems with women and minorities continues to focus its attacks on women of color — even as the freshman Democrats say they’re not surprised by it. Tlaib told POLITICO she’s become a lightning rod for conservatives because her profile isn’t one that has historically been seen in the halls of Congress. “I think the fact that somebody like myself, who’s a woman of color, is now an equal to many of them — people are very fearful of that,” Tlaib said. But the progressive firebrands are causing headaches for Pelosi and other Democratic leaders with a series of controversial remarks and actions that Republicans hope will help them rebound from the November disaster. On Monday, Omar apologized after Pelosi and a dozen Democrats slammed her for anti-Semitic remarks she tweeted out the previous evening. Omar — the first Somali-American elected to Congress — suggested GOP support for Israel is driven by campaign donations from a prominent pro-Israel group, a remark that played into ugly stereotypes about Jewish donors. 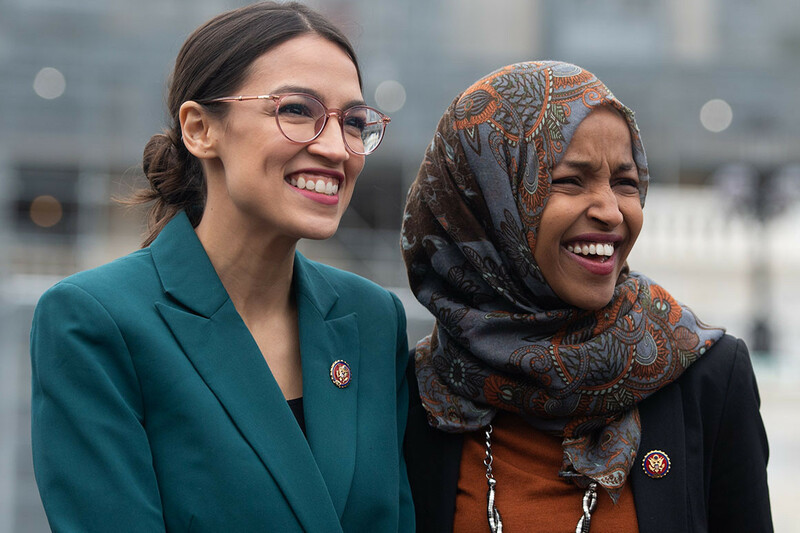 The firestorm, coming after Omar recently apologized for a 2012 tweet criticizing Israel, gave Republicans what they consider another piece of useful ammo as they try to paint the broader House Democratic Caucus as too radical for every-day Americans. NRCC officials spent the day blasting out emails attacking Omar, saying Pelosi and Democratic leaders had “put an anti-Semite” on the House Foreign Affairs Committee. “Ilhan Omar is the anti-Semite we thought she was,” read another post on the NRCC website. House Minority Leader Kevin McCarthy (R-Calif.) — who himself deleted a Twitter post last fall that Democrats said was anti-Semitic for targeting billionaire George Soros — suggested Republicans weren’t ready to let the issue go since Democrats didn’t punish Omar. “In the face of that abdication of leadership, Republicans will take action this week to ensure the House speaks out against this hatred and stands with Israel and the Jewish people,” McCarthy said in a statement. The Omar controversy came as Democrats are locked in a bitter battle with Trump over his push for a border wall, with members eager to train their fire on the president. Instead, House Democrats spent Monday denouncing one of their own colleagues, which dominated the media coverage and sucked up much of the oxygen on Capitol Hill. It’s the latest misstep by the freshman trio, who have become celebrities on the left because of their historic election victories and their skilled use of social media. On Jan. 3, just hours after she was sworn in, Tlaib was caught on video yelling out “We’re gonna impeach the motherf—er!” in reference to Trump. The video became a worldwide sensation, and even Trump — who has faced his own charges of racism and anti-Semitism — called it “disrespectful.” Republicans said Tlaib’s comments showed Democrats’ real aim is remove Trump from office even before special counsel Robert Mueller releases his report on Russian interference in the 2016 campaign. Ocasio-Cortez, who took down a potential speaker in a Democratic primary in New York and has forcefully urged the party to veer left, has been the constant target of NRCC fire. “It speaks to a fear-based strategy that they utilize in order to kind of create political support, instead of actually painting a positive vision,” Ocasio-Cortez said in an interview. Most recently, she tangled with Republicans over provisions in her “Green New Deal” and on Monday her office retracted one of the documents tied to the resolution. The GOP mocked the move — but her plan to combat climate change has already been endorsed by roughly 70 House Democrats and a dozen Democratic senators, including four 2020 hopefuls. The NRCC flatly rejects any suggestion that its constant criticism of the Democratic trio is racist or misogynistic, blaming reporters for even asking such a question. “Only in the minds of Washington, D.C. editors, reporters and pundits could calling out Democrats for racism, sexual assault and anti-Semitism be considered racist and misogynistic,” said NRCC Executive Director Parker Poling in a statement. Rep. Pramila Jayapal of Washington, one of most outspoken progressive Democrats, blasted Republicans for focusing so much attention on Ocasio-Cortez, Tlaib and Omar. And Assistant Speaker Ben Ray Luján of New Mexico, who chaired the Democratic Congressional Campaign Committee last cycle, said he saw the GOP efforts as a continuation of the Republican strategy. “Look at the millions and millions of dollars that have been spent in attacking Speaker Pelosi and now we’re seeing them double down on a failed playbook in attacking women again,” Luján said. Meanwhile, Rep. Steve Stivers of Ohio, who chaired the NRCC last cycle, predicted Republicans will always go back to hitting Pelosi — as they have for the past dozen years — until the Democrats pick a presidential nominee, who will then become their primary focus.